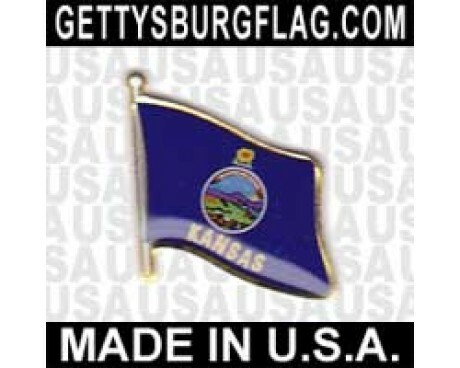 The state flag of Kansas has represented the state for almost a century with very few changes. 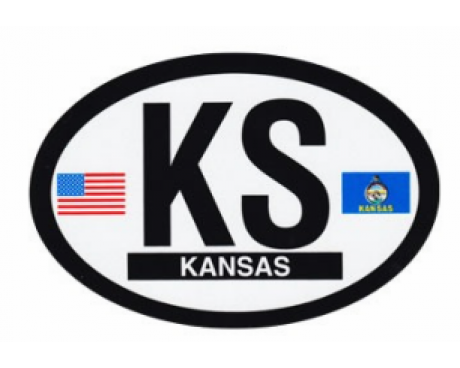 The design is centered around the state seal, which allows Kansas flags to tell the story of the state's early history as they flutter in the breeze. The state of Kansas flag has a dark blue field with the state seal of Kansas in the center with a sunflower above it and the state's name running along the bottom. The blue field is an element that it shares with many other state flags, which helps to emphasize Kansas' connection to the rest of the United States. The seal represents the state of Kansas itself, and it features a variety of images that reflect the state's development. It includes a rising sun and a wagon train that is traveling away from it, which represents the early settlers that moved to Kansas from the eastern states. It also displays a cabin and a river boat, which represent the agriculture and commerce that helped the state to grow. The natives of Kansas are represented on Kansas flags as a hunting party that is chasing a herd of buffalo in order to reflect their own history. Thirty-four stars are placed above the scene in honor of Kansas' place as the thirty-fourth state to be admitted into the United States. The stars are also a reference to the state's motto, which is also displayed as part of the seal. 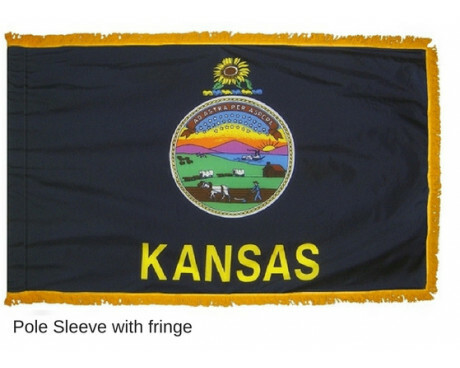 The state flag of Kansas dates back to 1925, when the design was approved for use as a state banner. The banner was originally designed to be displayed on a horizontal bar, but that led to many complaints. The state government authorized the flag for use on a normal flag pole in 1927. 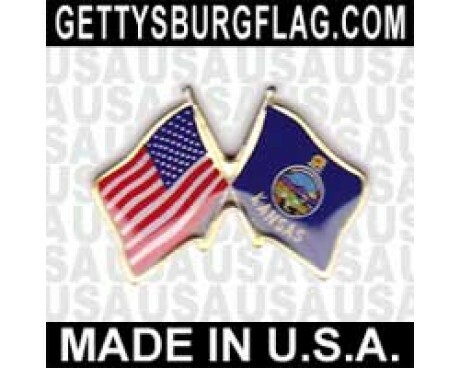 The first of the flags was displayed at Fort Riley by the governor of Kansas, and it remained in use among both the citizens of Kansas and the state's National Guard from that point on. 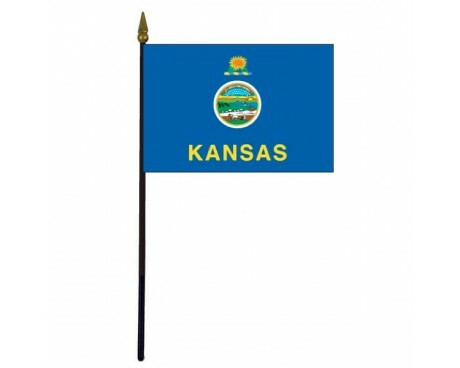 The design would not be changed until 1961, when the state's name was added to the bottom of the design in order to create the modern state of Kansas flag. The Kansas seal shows a ploughman in the foreground preparing his field for sowing. In the sky there are 34 stars, and the rising sun appears in the background. In 1861 the state was admitted to the Union. In 1903, the state flower was adopted, and the native wild sunflower from which the state takes its nickname. The seal was altered by size in March 1927, and the official flag was adopted with the sunflower above the seal, resting on a twisted wreath of blue and gold. On June 30, 1963 the name of the state was added to make the flag more identifiable. In parades by the National Guard and individual National Guardsmen, they use the same design on their uniforms as a shoulder flash. Kansas was originally part of the French Louisiana, and settlements began about 1727. By 1763, Kansas was ceded to Spain, and in 1800 went back to France. In 1803, it became part of the Louisiana Purchase to the USA, and became a Territory in 1854. On January 29, 1861 Kansas became a state in the Union.